You'll be Living the Dream in this Beautiful Executive Estate home located just 1 Mile north of Durango! This is not a typical rental, but "Our Personal Home" which We love to share with others when we are not there. It has that feel of warmth and charm plus the comfort of a 5 star hotel! The main house is 4 bedrooms & 3 1/2 baths, which sleeps 8. There's an 'Optional Guest House', with Queen Sleeper Sofa + 2 twin beds, and a Full Bath! The Guest house is $149.00 per night and must coincide with the main house rental. With the guest house it’s a total of 5 bedrooms & 4 1/2 baths. We just installed air conditioning, and new living room furniture. 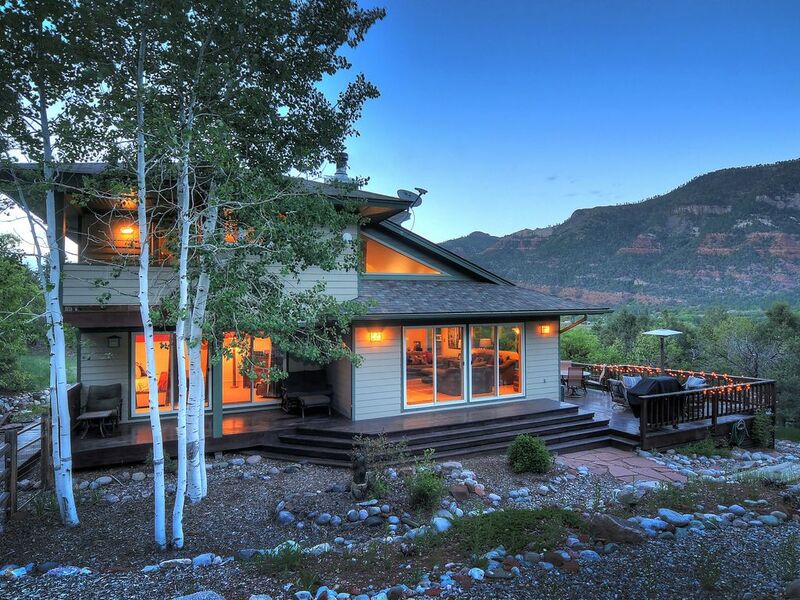 Breathtaking Animas Valley views from inside the home and its decks. Start your day with a steaming cup of brew overlooking the beauty of the valley. Since the home is just 5 minutes from downtown Durango, you can spend your days exploring Durango (take the Trolley into town); or hike our 42 wooded acres. When evening comes, you can kick back on the expansive decks or in the hot tub, in awe of the breathtaking 360-degree panoramic views of the Animas Valley, Red Cliffs and the Needles Mountains. Enjoy the romance of the steam train as it chugs by in the distance, with the mountains as your backdrop. This amazing open floor plan is perfect for 8 people in the main house with 4 bedrooms, 3 1/2 baths, 3 fireplaces, and baseboard heating (Nest theromstats, five-zones so everyone is happy). Lets not forget the Hot Tub with incredible mountain views. The Master bedroom boast its own private deck and gas fireplace! Also the 2nd Master bedroom on the main level has its own fireplace, patio and private entrance! The furniture, and all furnishing in our home are new or less than 6 yrs. old. There is a new full bath on the main level and 1/2 bath that has just been remodeled. We know you and your family/guests will enjoy the vaulted ceilings, wire brushed knotty pine doors, hardwood floors, complete sound system, temperature controlled wine cooler and all the amenities (even a high efficiency washer and 2 dryers) . For our winter guests, our 2 car garage is heated. Those 42 acres back up to 1275 acres of BLM land, and if you’re into rock climbing, they include elevation changes of 1,000 feet with some sheer rock faces. Bring your helmets and life jackets please (required!). You can also enjoy family game night with an Foosball table, Air Hockey table, Ping pong table, poker table top and many other games. Be prepared to enjoy every aspect of Durango from this perfect location! . VIEWS, ROCK CLIMBING, RIVER RAFTING, FOUR WHEELING,GOLF, VIEWS, TRAIN, GLIDING, FISHING, SKIING,LARGE KITCHEN, 3 FIREPLACES, LARGE MASTER BEDROOM, DINING ROOM, 2 CAR HEATED GARAGE, GUEST HOUSE, STORAGE, SATELLITE TV, INTERNET, WASHING MACHINE AND DRYER, DECKS, PATIO, ANIMAS VALLEY, NEEDLES MOUNTAIN, MOUNTAIN BIKING, DINING, SHOPPING, DOWNTOWN, KAYAKING, HIKING. We provide Heavenly Beds, as well as the finest Sheets/Linens, Towels. Hand Soap, dishwasher soap, dish soap and Paper Towels. There is a Pack & Play for infants and toddlers as well as an Iron ant Ironing board. Laundry soap and Dryer sheets are also provided. There is a wine cellar, Picnic gear & coolers, children games & more. toilet, shower, Totally new 3rd Bathroom with 6 ft walk in shower! Gorgeous Mountain Views in all directions!! We Backup to Animas Mountain in our backyard. It goes up 970 ft. of which we own 865 ft. and 42 acres. The property backs up to 1275 acres of BLM land. Baseboard hot water with 5 separate Nest digital thermostats for each room. High Efficiency Washer. Soap and Fabric softener is provided! We have 2 dryers. 1 High Efficiency, and 1 standard electric new Jan. 2016. There are 3 fireplaces in our home! Up to 4 vehicles with guesthouse. Brand new Luxury hotel towels July 2018. New Stainless Steel / with ice maker & water. Stunning views and the best cookware available. Dishes, glasses, placemats, silverware, wine cellar, wine glasses are provided. Linens napkins, soap. Coolers in pantry. Vizio 50' in main house and a 50' in the Guest house. Blue Ray players in both Main and Guest house. Massive decks with stunning views of mountains and the valley. 2 complete patio sets with seating for 8. Plus 4 extra chairs. Additional outside couch and lounge chair on covered patio. DMR is 15 minutes away directly up Hwy 550 Wolf Creek is just over 1 hour 20 min. away. Activities: Skiing, Snowboarding, Fly Fishing, Kayaking, Cycling, Rafting, Golf, Mountain Biking, Hunting, Hiking, Swimming, Snowmobiling, Sight Seeing, Horseback Riding, Rock Climbing, Antiquing, Sledding, Cinemas, Restaurants, Live Theater, Museums, Shopping, Parasailing, Miniature Golf, Racquetball, Wildlife Viewing. Perfect place for a couple families to stay for our annual ski trip. Perfect spot for our family ski trip. The owner and property manager made sure we had everything we needed. House is well kept and had great amenities. Thanks! Thank you so much for taking such great care of our home. It was our pleasure to have you all. We went up to Durango for the weekend and had a great time in this beautiful home. The size suited us perfectly! It was a close drive to anything in town-we even took advantage of the hot tub which has an amazing view of the snowy mountains. The owner and property manager were easy to contact and very helpful and friendly. Highly recommend for your trip to Durango! Thank you so much. We look forward to having you all back soon. Wonderful home and a great base! We had a great time staying at this house! Owner and property manager were very responsive and willing to help in any way. House is located perfectly, just north of Durango, but still very close, and on the way to Purgatory. Home was clean, well appointed and had everything we imagined we would need. We would definitely stay there again. Thanks Dennis! Thank you so much for staying with us, and for your review. We would love to have you back anytime. We had a magical time at the house, perfect location for everything. Close to town but not too far to the Ski Hill. Had everything our big family needed plus the house is beautiful! We were very comfortable and loved Hot tub under the stars! We really enjoyed having you all. Nice house in a great location. A few minutes to town and easy access to 550 to go to Purgatory and Silverton. Great views. One thing to note is that there is no bathroom on the lowest level for the twin bedroom, so you have to figure that out. (There is a half and full bath right upstairs, so it works fine for kids). The only issue we had was with the WiFi, which also runs the TV (apps) access. We would highly recommend an upgrade on the Wifi, and/or get some kind of cable TV. Great house though - nice privacy since the two bedrooms on the top level have attached bathrooms. Very well stocked kitchen, and great patio and firepit area. Thank you so much for staying with us, and for your review. The property manager and I had no idea you had an issue with the WiFi. We switched from satellite TV to Internet TV because it is more reliable in the mountains and with our weather. It also offers more options, as we have DIRECTV Now, HBO Now, Netflix, and I Heart radio. Before we only had Direct TV with no movies. CenturyLink is the only Internet provider and works well unless everyone streaming videos or games to their own devices plus using tv’s. We will be sure to run a speed test to make sure we are getting the speed we pay for, which is the maximum available. The Guest House is: $149.00 per night. Cleaning fee $75.00 It has a Queen Sleeper Sofa, + 2 Twin Beds, Full bath, and a 50 in. TV. and a 4 place dinette. It was New 4/2014. Any 2 night stay will result in a $75.00 per night surcharge. Standard Weekly rate is $2765.00 Rates are subject to change until reservation is confirmed.